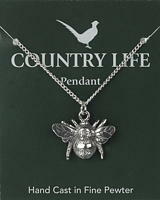 This Bee is made from pewter and is supplied on a silver chain. The information card gives details about the countryside. Pewter Celtic boar supplied on a silver chain. The information on the reverse of the fold-over card describes how the design is inspired by ancient Celtic designs.